There are a lot of guys in this state that have all the ability in the world and have shown great flashes of being great over their high school career, but a lot of those guys figure it all out for their senior year and just dominate the competition. One of those guys is LaGrange senior DT Kevin Victorian. Before this season, Victorian was on a lot of people’s sleeper lists in recruiting. At 6’3 and over 260 pounds, Victorian looks the part of a big time defensive lineman, and he showed what he is capable of in his breakout senior season. He was one of the best players on a really good defense along with other defensive standouts Vincent Wilson and Devin Jack. The trio helped the defense become the main strength of the team. The group gave up over 30 points twice in the entire season. Statistically, he was one of the best in the state racking up 78 tackles, 22 tackles for loss, five forced fumbles, three fumble recoveries, and 11 sacks. These impressive numbers showed how disruptive he was to opposing offenses throughout the season. This huge season grabbed the attention of many people including us when he was one of our honorable mentions for the 4A Defensive Player of the Year. He also was named LSWA 1st Team All-State. For Coach Jules Sullen and the LaGrange Gators, they will miss an interval piece to their team in Kevin Victorian, who is very athletic and versatile as a football player. The good news is that the senior Gator defensive lineman will continue his football career at Grambling State University. The Tigers are getting themselves a really good football player who can play inside, outside, and is even athletic enough to play outside linebacker. It will be very exciting to see how big of an impact that he will make on the Grambling defense in the next couple of seasons. In today’s recruit article, we caught up with the Grambling signee as he talked about his high school football career, the reason why he chose to play for the Tigers, and so much more! LAFM: What are your stats and accomplishments while at LaGrange? I was a two time 1st Team All-District, All-District MVP, two time All Southwest, and two time All-State selection. LAFM: You have signed with Grambling to play at the next level. What has helped you make your decision to play while at Grambling? I made the decision to go to Grambling because I had a good relationship with the coaches, and it felt like home. I think I have a good chance of playing as a freshman. LAFM: What other sports did you play while at LaGrange? I also played baseball at LaGrange. LAFM: What was your pregame routine while playing for the school? My pregame routine would be listening to old 90’s R&B before every game. LAFM: What are your biggest strengths to your game? The biggest strength, to my game, is my speed. LAFM: What are some things that you need to improve on when you get to Grambling? I need to improve on getting stronger when I get to Grambling. I model my game after Jonathan Allen (former Alabama defensive lineman who is a 1st round NFL Draft prospect) just because we play the same position. 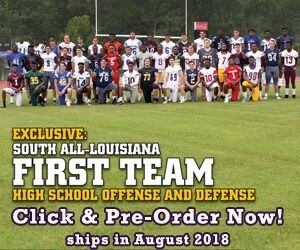 I am also about the same size as he was when he was going to college, but my favorite players would have to be Jamal Adams (former LSU safety who is a 1st round NFL Draft Prospect) and Reuben Foster (former Alabama linebacker who is a 1st round NFL Draft Prospect) because of the passion that they play the game with. LAFM: The Gators had an up and down season going 5-6. What were your thoughts on the season as a whole? This year, our team was very young so we had a lot of first time players that we had to lean on. They were learning along the way so it took us a while to find out our identity as a team. LAFM: Who are some of your teammates that you like to give a shout out to? I would like to give a shout out to Devin Jack, Vincent Wilson, Kamron Davis, and Anthony Johnson. I came in with Devin and Vincent since the beginning. Playing with those guys was very fun. I saw a lot of great plays being made over the years by these two guys. Anthony and Kamron are the two running backs currently at LaGrange that are going to do some great things. When football season is over, I like to train with a couple of old teammates. An interesting fact, about myself that nobody knows about, is that I like to listen to country music. LAFM: Who was the best offensive lineman that you went up against and why? The best offensive lineman that I went up against was Reggie Weldon from LaGrange. He’s not a big guy, but he moves very well and is really strong. I like to thank God, my family, my coaches, and my teammates for driving me to be great. LAFM: As a defensive lineman, do have a go to move when it comes to rushing the quarterback? My go to move, as a defensive lineman, is a double jab step and a spin move because it throws the offensive lineman’s footwork off. LAFM: What is your advice to next year’s LaGrange team? My advice is to listen to the coaches, attack the weight room, and study film. I’m going to miss playing with my childhood friends. LAFM: Why should Tiger fans be excited to have you on their football team? Tiger fans should be excited about having me on their football team because I make big plays in big moments. I will be bringing PRIMETIME to Grambling University.